Some recipes are timeless, like classic deviled eggs.. They are perfect for cookouts and picnics. Just put a big tray of them on the table and watch them disappear. Have you noticed that they can be popped in a mouth with no real chewing? LOL Of course, the taste is so good you will WANT to chew them. In my adventure of low-carb dieting, I am resurrecting recipes that I had previously skipped – deviled eggs, for instance. Deviled eggs do not fit with traditional weight loss plans. They contain mayonnaise, which is high in fat with lots of calories. It is totally different with low carb eating plans. On a low-carbohydrate diet, be it Atkins, South Beach, Carbohydrate Addicts, Keto or Trim Healthy Mama (S meals) – the more deviled eggs the merrier!. That makes me very happy! Classic deviled eggs are easy to make and keep well in the refrigerator. When I make 12 of them (6 eggs, cut in half) they last me about 5 days and taste great to the very last one. Be aware, when serving this delicious side dish at a party, make lots of them. They disappear fast! Hard boil the eggs, cool, peel and cut in half lengthwise. Gently edge the yolk out of the white and place in a small mixing bowl. Mash the yolks together with a fork. Blend in mayonnaise, vinegar, mustard, salt & pepper. Spoon the mixture into the center of each egg-white shell. Lightly sprinkle with either dill weed or paprika on top. How To Make Pesto Eggs the Easy Way! Looking for a little variety for breakfast? Make pesto eggs! This recipe is an adaptation of a mint pesto egg recipe featured in Good Housekeeping Magazine this month. They have quite a collection of delightful egg recipes in there. This one looked especially good but I am not a “mint person.” So, I used classic pesto instead and does it taste delicious. Bake at 425° for 12-16 minutes till white is set and yellow is still runny. Double, triple or whatever for more servings. Just line up the Ramekins on the baking sheet and bake together. Eggs – How Do I Tell If An Egg Is Bad? I love great tips. When I learn something new that I’m going to use, I share it with you. Like the blueberry muffin tip last week. I was so excited when I learned that one. Well, this one is awesomely easy. Ever cracked an egg into a skillet only to have the yoke immediately break? Even worse, open an egg and “phew” the scent tells you to get rid of that bad egg as FAST as you can! So, besides staying right on top of the expiration dates on the carton, how do you tell if that lovely egg is still good? How Do I Tell If An Egg Is Bad? Lay the egg gently into it. If the egg sinks … it is GOOD. If it floats … say “bye bye” to that BAD egg. “Eggs in a Basket” is a delicious quick breakfast that the egg-lovers in your family will love. Fun and easy to make. When I was a little girl, this is a dish my mother made to break the monotony of the cereal – scrambled eggs – pancakes routine. It became a family favorite. How do you make it? Simply put, you cut a whole in the center of slices of bread, place them in a warm buttered skillet, crack an egg in each hole then cook them, turning once. Eggs in a Basket may sound complicated to make but its not. The important thing to remember is to keep the skillet on medium-high heat and watch it so that they don’t burn. Don’t raise the temperature. The extra minute you save by turning the heat up too high will ruin an otherwise great breakfast. Example of cooking too long. The are a bit too dark for my liking, though they still tasted really good. Cut a hole in the center of each slice of bread using a small cup as you would a cookie cutter. If you can’t find one, cut them out with a table knife. Keep the holes. You will be browning them right next to your bread. Melt butter in the pan (at least 1 T) and place the bread in it, including the holes. Break an egg in the center of each slice of bread. Cook until you can see that the part underneath has turned white. Flip them and continue to cook to desired doneness. You will want to be sure that all of the white is cooked. I prefer the yokes to be runny, but you may like yours more well-done. Chicken is my favorite protein, next to eggs. Interesting. They are so closely related! If I could have a chicken meal 5 days a week, I’d be a very happy camper. All I would need the other two days is a juicy hamburger and a steak and my week would be complete. Lifestyle change: it’s time to get my eating in order, saying “goodbye” to white flour, white rice, potatoes (mostly) and sugar. Ouch. The only way I’ll stick with a low-carb plan is to come up with some simple recipes that taste really great. If they are too complicated, time will get in the way and endanger my success. Day one: I made a batch of chicken salad — my own concoction — enough for two days of lunches. Tasted really good. If you’re not watching carbs*, add some green seedless grapes to this and forget the lime. Heavenly! Heat a non-stick skillet on medium and add 1 T cooking oil. 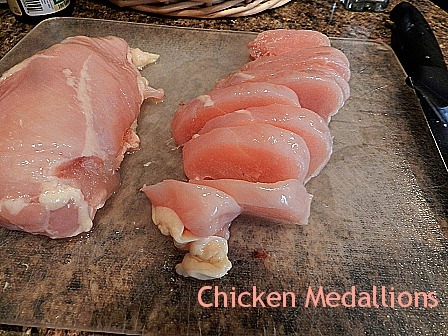 Slice your chicken in medallions and stir fry till done. Remove them from the skillet and cool in the refrigerator. When cool, cut chicken into small chunks. Combine with mayonnaise, walnuts, onions and celery. Pile 1/2 of the salad on a bed of Romaine lettuce. 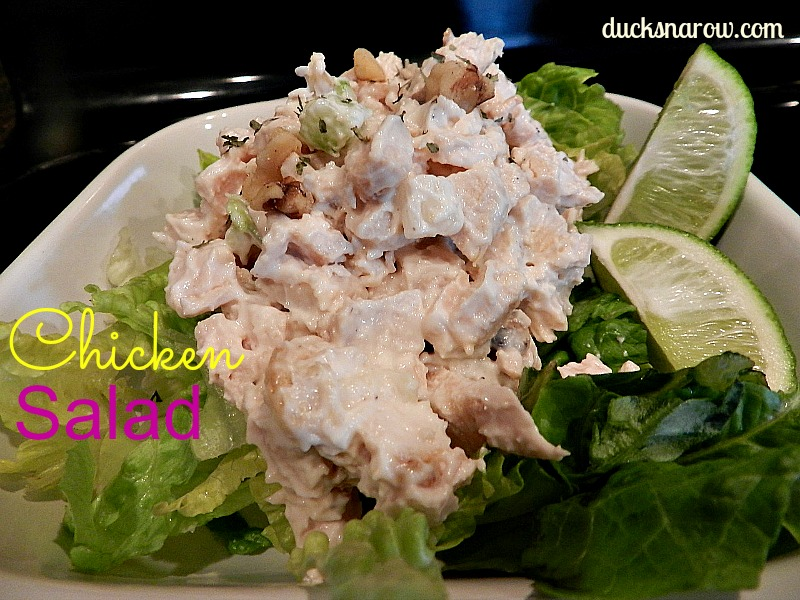 Squirt lime juice on the sides of the lettuce and on top of the chicken salad, as desired. Store the other half in the refrigerator, or invite a friend to have lunch with you and use it now! Have some easy low-carb recipes to share? I could use the help!